Is There a Better Place to Educate Our Kids About Renewable Energy? It seems like every day we’re hearing about budget cuts in education; not just on the local level, but on the national level as well. Just a few months ago, the House Appropriations Committee unveiled an education spending proposal that would have slashed Department of Education funding by $3 billion. To many U.S. citizens, underfunding our nation’s educational system seems like a shortsighted policy. After all, a well-educated populace is key to continued prosperity and innovation. Regardless of your politics, it’s hard to disagree with the idea that our schools could use more money. And what better way to save money than by going solar? There are many reasons why going solar makes so much sense for schools. For one thing, many of our schools have flat, expansive rooftops, which are ideal for solar installations. And for another, solar arrays can be used to enhance science, technology, engineering and mathematics programs. STEM education is and will continue to be a key factor for success in the high-tech economy. Additionally, many schools would see substantial savings from going solar, and that money could be used to fund upgraded educational tools, better sports and arts programs, and enhanced curriculum in core classes. Finally, going solar instills environmental stewardship into young learners. It’s one thing to promote green living in science class, but going solar puts words into action, and shows that individuals can band together to become a force for positive change. A great number of schools have already gone solar, and their results are quite impressive. California’s Mount Diablo School District installed solar arrays at 51 of its campuses, and is projected to save $220 million over 30 years. University of California Merced installed a 1-Megawatt solar array that will provide more than 60% of the school’s summertime energy needs, and more than one fifth of its annual electricity consumption. These case studies are compelling, but they’re not the only ones. 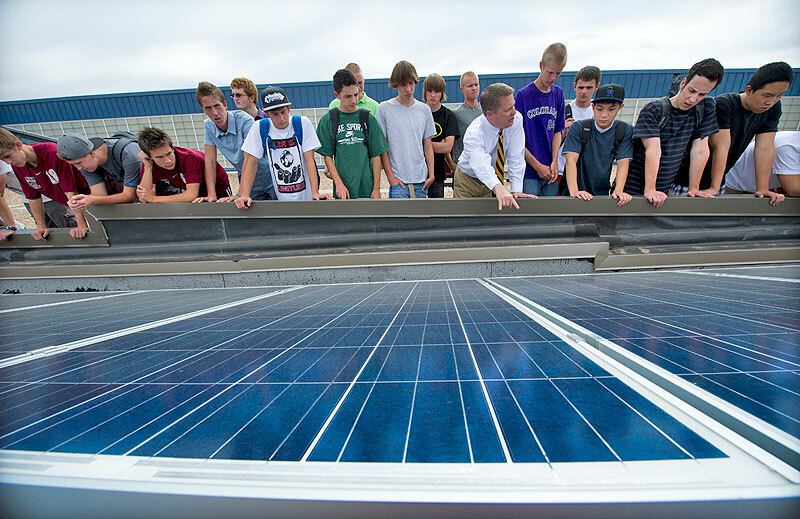 Thousands of schools have realized the many benefits of solar energy. A study conducted by the Solar Energy Industries Association found that while thousands of schools have already adopted solar energy, there’s still a huge amount of untapped potential in the form of empty school rooftops across the country. The industry organization estimates that if each of the more than 70,000 for which solar would be a cost-effective investment were to actually install photovoltaic systems, the total solar capacity on U.S. K-12 schools would reach 5.4 GW. That would boost our nation’s total solar capacity by more than 33%. Collectively, the schools surveyed would save more than $450 million dollars over the next three decades. That kind of money could really enhance the health of our cash-strapped education system. As you can see, the case for solar energy in schools is compelling. Going solar saves much-needed money, creates new educational opportunities, and helps shape a greener tomorrow for the citizens of the future. Interested in encouraging your school to go solar? Good for you! Here are two great resources to help you get started. KyotoUSA is a non-profit dedicated to working with communities to help them reduce their greenhouse gas emissions. Their HELiOS project assists schools in enacting renewable energy initiatives that will help lower costs and provide the maximum educational benefit. The Foundation for Environmental Education brings businesses, environmental groups, and government agencies together to work toward a sustainable future. The foundation’s Solar School program facilitates solar installations and educational programming at schools across the country. If you’re trying to encourage solar development in your school system, your community may be your greatest resource. Spread the word, and network with your neighbors. There’s strength in numbers, and you may be surprised to learn that your community is full of talented, like-minded, and dedicated allies.